I've updated the artbook ! The Pen Stealer is being completely revamped. The new one will come in an undertermined future. On est en train de tout chambouler le Pen Stealer. La nouvelle version viendra dans un futur indéterminé. Hi from me too. Resident script-writer/dialoguist (I declare this to be a word, darnit) of the Pen Stealer. If you're just stumbling in, you're probably wondering, so what the hell are these people talking about?! Basically we're talking about the Pen Stealer, an online manga-style comic about a boy who steals magic pens. I write, she draws, you read. A warning, we take "manga-style" very seriously. So it's written right to left like a translated Japanese manga. Mostly because we find it amusing. 1) the script for chapter 5. It needed revamping because apparently I was brain dead when writing it before. Beware the Eraser! Mwahaha. 2) page 63 of the Witness, which is a villain-centered side-story that spoils most of the first arc of the comic. I'm hoping to time the writing/revisions, so it can be made public when Chu finishes the art for the 13th Chapter, which is our projected end of the story arc. 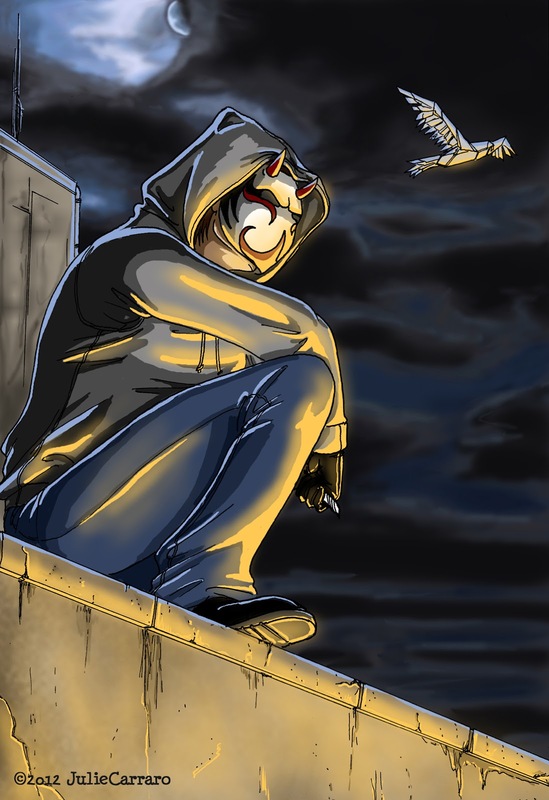 3) the "omake" for chapter 2...the return of the Masked Reporter!! Anyway, that's pretty much it. You are now up to date. I won't be writing this in French, as my French is much much worse than Chu's English. As in, it doesn't exist. Anyway, please enjoy the comic! comme on a eu des problemes avec notre forum, on a decide d'ouvrir ce ptit blog pour pouvoir communiquer avec nos nombreux fans... hmm... ouais. Enfin, comme ca, on pourra vous tenir au courant de l'avancement du Pen Stealer, et vous pourrez continuer a nous donner votre avis et vos suggestions!!! Voilou, en attendant, bonne journee a tous! anyway, we'll be able to keep you informed on the Pen Stealer's progress, and you'll be able to give us your opinion and advice! We are Kalinara and Shinsanagi, your hosts. What is the Pen Stealer you ask ? Why, it's everything imaginable! It's a tale of love, magic, mystery, sorrow, loss and hope and all things in between. Actually, it'll be an amateur online comic, in the style of japanese comics, or manga, centered around a high-school kid who steals pens. Have a look around. We're quite fond of it and we hope you'll be too. Nous sommes Kalinara et Shinsanagi, vos hôtes. Vous vous demandez qu'est ce que le Pen Stealer? Et bien, c'est tout ce que vous pouvez imaginer! C'est un récit d'amour, de magie, de mystères, de souffrances, de pertes, d'espoirs et tout ce qui va avec. En fait il s'agira d'une BD amateur en ligne, dans le style des manga japonais, centrée autour d'un lycéen qui vole des stylos. Venez y faire un tour, nous sommes assez attachées à ce projet, et nous espérons que vous le serez aussi ! All characters/ concepts/ pictures/ texts are copyright Melissa Krause & Julie Carraro. . Awesome Inc. theme. Powered by Blogger.